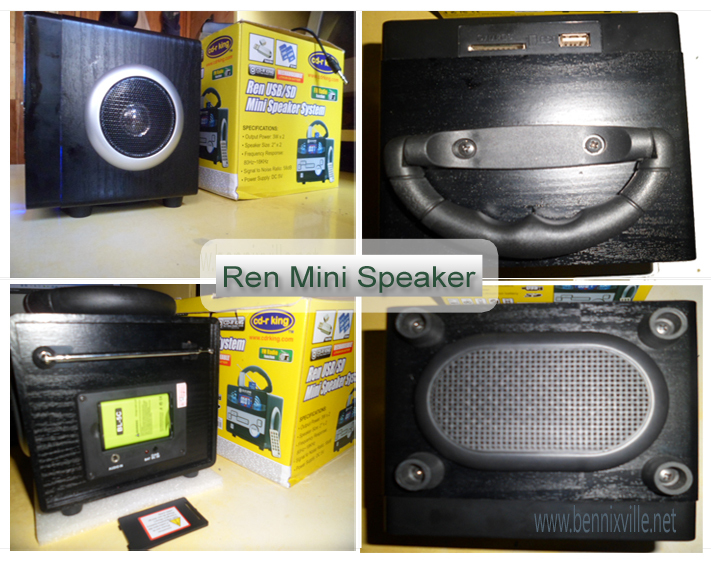 Ren Mini Speaker is one of newest audio gadget from CD-R King, the leading retailer of most affordable consumer electronics in the Philippines. I got this item from my friend to test and I am impressed how this mini speaker sounds up. The Ren Mini Speaker is a portable 6 watts music player capable of playing mp3 files from memory cards & usb with auto play back features. Equipped with stereo port, it allows you to play-in music from your computer, mobile & digital players such as iPod your room or party outdoor. Using the remote control you can switch to different playback modes, playing from USB, MMC or scan FM radio if you run out of mp3 files. While playing you can select forward or rewind, adjust the volume, shift the EQ control, and power or off the player thru the remote. The front has the manual volume knob, power button and glittering LED light effects. Each side has 3 watts speakers while in the bottom is oval-shaped bass I think. The top is where the MMC slot and USB port located while the battery, antenna, stereo, and adapter port in the rear. Believe me, this speaker sounds louder than my iMac, clear acoustics and very easy to operate. Its battery life can last around 45 minutes of straight playback (I don’t know long it will fully charge maybe a few hours because it has a mobile-size Li-ion battery. I recommend that you switch off the player while charging to avoid fast battery deterioration).As of now I only found one problem with this mini speaker, sometimes it jumps off for while playing then resume in a moment. My overall impression is, I am pleased with this product considering it’s pretty affordable for only PhP 580 with 1 week warranty.